Σε πολύ καλή τοποθεσία της Nha Trang, το Mojzo Dorm Nha Trang είναι μια πολύ καλή βάση απ'όπου μπορείτε να εξερευνήσετε την σφύζουσα πόλη. Σε μια τοποθεσία μόλις από την συναρπαστική ζωή της πόλης, αυτό το 1 αστέρων ξενοδοχείο αποτελεί ένα εξαιρετικό μέρος και παρέχει εύκολη πρόσβαση στα μεγαλύτερα αξιοθέατα της πόλης. Από τη βολική της τοποθεσία, η ιδιοκτησία προσφέρει εύκολη πρόσβαση σε κορυφαίους προορισμούς της πόλης. Στο Mojzo Dorm Nha Trang, η άψογη εξυπηρέτηση και οι ανώτερες εγκαταστάσεις συντελούν ώστε η διαμονή εκεί να σας μείνει αξέχαστη. Κατά την διαμονή σας σε αυτό το υπέροχο ξενοδοχείο, μπορείτε να απολαύσετε τα 24ωρη υπηρεσία δωματίου, δωρεάν WiFi σε όλα τα δωμάτια, 24ωρη φύλαξη, ημερήσιος καθαρισμός, αυτόματο πλυντήριο. Απολαύστε ανέσεις υψηλών προδιαγραφών κατά τη διαμονή σας. Ορισμένα δωμάτια περιλαμβάνουν κρεμάστρα ρούχων, θυρίδα, καθρέφτης, ασύρματη σύνδεση internet (δωρεάν), κλιματισμός - ό,τι πρέπει για να αναζωογονηθείτε μετά από μια γεμάτη μέρα. Εξάλλου, το ξενοδοχείο διοργανώνει πολλά ψυχαγωγικά δρώμενα έτσι ώστε να έχετε πολλά πράγματα να κάνετε κατά τη διαμονή σας. Το Mojzo Dorm Nha Trang είναι ο ένας και μοναδικός προορισμός για εσάς που ψάχνετε ποιοτικά καταλύματα στη Nha Trang. Loved my stay here! The staff were amazing- the made an effort to remember names, and gave great recommendations. The rooms were super clean. They offer tea and snacks, free beer, and a family dinner which makes it super easy to meet people. Staff so lovely. One lady would go out of their way to remember everyone's name. Kettle available. Free beer hour, free coffee/tea hour with biscuits. Cheap breakfast available and cheap family dinner to meet people. Rooftop good place to socialise. the hostel offers so many events, and the staffs were very helpful with all my questions. Everything’s great! I really recommend this place to solo travellers,this place is the biggest reason made me think Nha Trang is a great place for real. this place is amazing. the staff are so friendly. the free beer social hour is SOO SOO fun and convenient.. just ask for music and it's perfect. the cleaning crew will literally just walk into your room and clean around you, even if youre still in there. kind of annoying but they're fast. The hotel has the good location, near the beach. And the staffs are nice, who can help you a lot. But my braclet was stole which I put under the pillow. So please take care of the luggage if you want to book. The girls at the hostel will do everything to make your stay special. They are very friendly and polite. Good breakfast, good shower and comfortable beds. They are always ensuring hostel is clean! Would recommend for both solo travelers and groups. Easy walking distance to beach and on a main road but although I was in a front facing room didn’t bother me. The Dorm was very clean. The employees very helpful, friendly and patiently. To be honest I expected more: like the rooftop is only open during Breakfast, lunch and dinner. It would be nice if you could stay a little bit longer. social hostel in a good location. The rooms are dark, but there are two social areas. little touches like free beer/free tea and coffee sometimes. Staff want to help, and are helpful. I booked my trips through them and asked advice. i really enjoy the toproof where you can get some free beers. nice staffs who are very helpful. very easy to meet people there. i just like everything there. i would stay there again if i come back to Nha trang. The girls at reception are amazing, so is the rooftop with free breakfast and family dinners to socialize! Beds are also super comfortable and the location is good. Only the floor in the room could have been a bit cleaner. Dear Sarah, We are happy to receive your feedback having stayed with us. Thank for your sincere comments. We will strive to improve the quality of our services to ensure you have a more enjoyable holiday next time. We hope that you will have nice trips. Best regards, Mojzo Dorm. All is perfect in this hostel, the beds are good, bathroom is ok, staff is super friendly super nice and helpful, but the best of all is the (free) breakfast. You have all what you dream to have in the morning (just not meat). Free beers also on the rooftop ! If one day i come back, Ill stay here for much more time! It is easy to walk past(I had trouble finding it as the directions in here lead you several blocks passed the real location) but once inside Ly and her staff are wonderful! I was always greeted by name and they were super helpful any time I had questions! 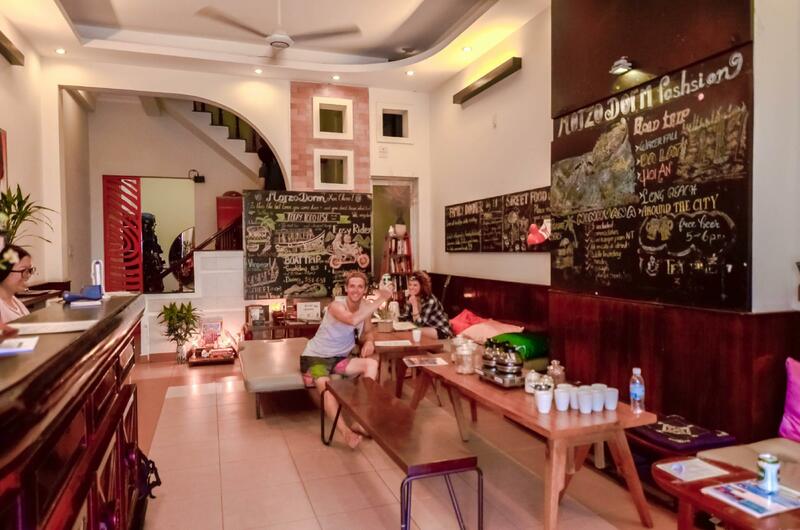 This is an amazing place to stay if you are on budget and want to socialize without staying in a party hostel. It’s located in a VERY noisy street. Rooms are small and guys, please, put curtains in all the beds and not only in the bottom bunk. AC doesn’t work ok and fan is annoying at night. What it makes this place special is the reception staff. I have never seen an expertise like that and all guest love them. You got the service and with a big renovation this place can be really really good. Best location, staff are friendly and kind, atmosphere of hostel is really nice. Friendly and accommodating staff. Freezes and beer certain hours and delicious food! IF THE ROFETOP TERRACE NOT BE CLOSED DURING THE NIGHT SHOULD BE BETTER. Σιδηροδρομικός Σταθμός Nha Trang στα 1.36 χλμ.